Douglas Ritherdon has become the proud owner of a Van Veen Romilly called Serina. 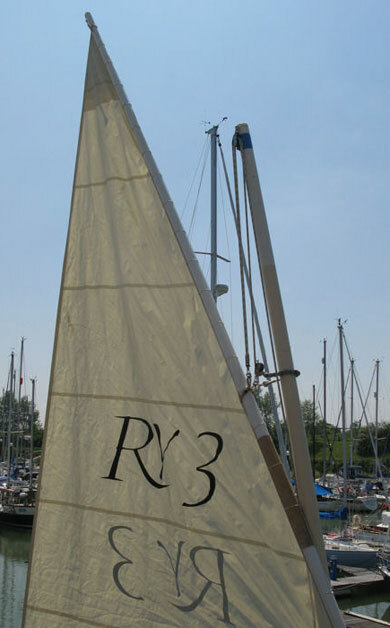 Which is R3, apparently the third Van Veen boat built. Douglas and I have had an email conversation about the halyard arrangement, I have my masthead in a bit of a mess and Douglas was keen to think things through before sorting his own out. With Douglas’s permission I’ve cut and pasted some of that discussion here. 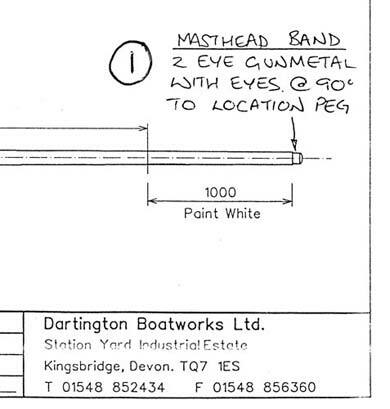 Douglas said “Looking at the photo of the top of your mast it appears that you have a different arrangement to that shown in the Nigel Irens diagram. If you look at the diagram you will see that Irens leads the rope to and from the halyard block both in and out from the same side of the masthead block. Hope that makes sense! 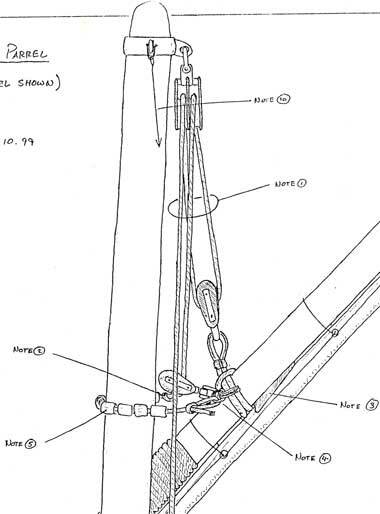 I think it is possible to arrive at a reasonable arrangement but I think it will prove impossible to stop the main halyard leg leading to the deck block from crossing the last leg of the halyard to the parel beads and thus there will be some friction loss. Iren’s arrangement with the masthead block at the aft of the mast eliminates all friction from crossing lines. 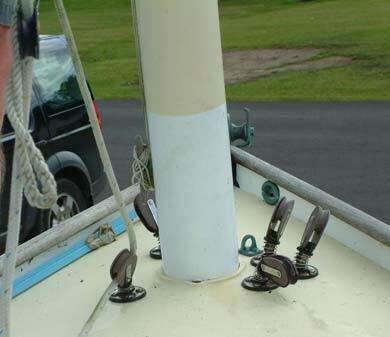 I sent him the following pictures showing the mess my halyard is in amongst other things. I think that I (Phil, “Riant”) have two problems. 1. 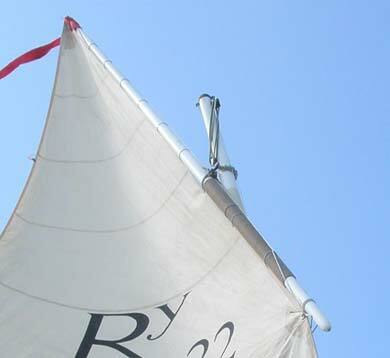 The foredeck halyard block is on the opposite side of the mast to the masthead fitting. This may be the result of an error on the construction notes. See image below. 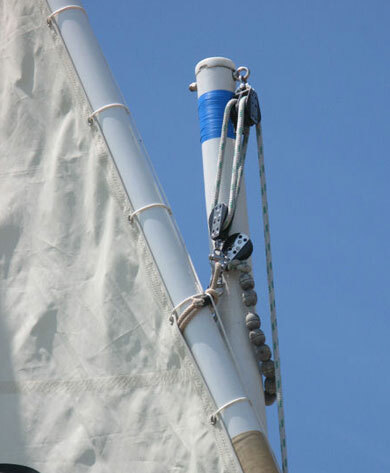 I think that the masthead halyard block should be on the same side of the mast as the locating peg ie exactly aft of the mast. 2. I’ve passed the halyard rope incorrectly through the blocks leading to friction when the sail is fully hauled. Douglas said “Your pictures are very useful – thanks. It seems the Dutch boats are rigged a bit differently to yours. On the starboard side deck are three tails leading aft to cleats (or clutches) and winch if necessary – furthest out is the luff downhaul, having a two part tackle through two eyes and blocks by the mast; in the middle is the tackle you call the snotter (parrel line) leading through a block at the fore end of the sprit and finally the inside line is the main halyard tail leading through the aft block by the mast. On the port side are two reefing lines. Douglas later said “A beautiful day yesterday, bright sun and no wind, just right to get the mast down and re-reeve the halyard arrangement. First snag – the mast was firmly stuck in it’s socket. Eventually after much wriggling, banging and liberal amounts of Fairy Liquid, a power derrick pulled it out. I think the photos show the run of the halyard arrangement and most particularly in my opinion, how the sprit uphaul loop comes from the aft side of the masthead block. The parrel leg is on the sheave nearer the mast and the halyard fall on the outside sheave, both at the front of the block. It certainly seems that there are no major twisting forces in this setup. Because of the mast rake even the halyard fall seems to be a reasonably clear drop to the deck block. The masthead block itself has a fixed becket, that is it is not a swivel block. As I said there was no wind so I have yet to find out how it really works, hopefully tomorrow. The picture shows the damage caused by the twisting block in the previous arrangement. Close examination showed previous damage that had been filled and repainted. The blocks are Harken and have dome headed rivets proud on both cheeks. 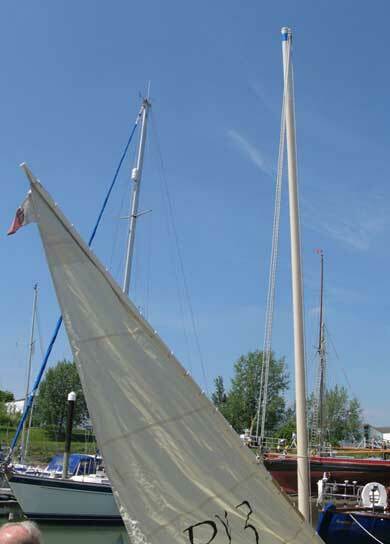 I might look for a smoother cheeked block and perhaps put a chafing protection on the mast itself. Maybe a leather sleeve or a stainless steel chafing patch glued and screwed. Thoughts for the winter though. Another thought – the parrel block would work better if it were smaller. Ed Burnett has very kindly allowed me to scan and include his diagram. An A4 pdf version suitable for printing can be found here. There are various ways to reeve any tackle, and whatever is found to work best is of course the way to go. However, trying to reeve the blocks as shown in the sketch may not be the best solution if the orientation of the eyes and the placement of the deck gear is not the same as shown in the SPV plans. In any case, part of the fun is experimenting with different leads to establish which gives the cleanest run! Do you think that the masthead block should be on the starboard side or the aft of the mast? Personally, I think the halyard block is better on the aft face of the mast, but that may not be the case for the production boats. There may actually be a better solution involving one single block on the stbd side, and a second hanging on the aft face to give the final lead down to the deck. The single blocks, being narrower, will sit more happily alongside the mast without digging into it and each can then find it’s own angle without being affected by the other. That’s what I would try next. As a Romilly virgin having just purchased one with little in the way of accompanying paperwork, does anyone know if it’s possible to obtain this excellent 55 page manual from Van Reen? Van Veen Jachtbouw issued a manual with the Romillys they built. These manuals are produced as a requirement of the EU Recreation Craft Directive along with a brass plaque on the transom showing the boat’s CE Category. Lots of pictures and all text in Dutch. I suspect not of much use to boats not built by them. I read the halyard rigging discussion and I would like to add something to it. Last year I had sort kind of problems, caused by wringled halyard rope but also because of tufnol blocks. Lowering the main sail went not smootly at all and I had to pull the sail down by hands. I talked with Karel Heynen about this problem and – thanks to Karel’s suggestions – made the following changes on Ed Burnett’s drawings. See also my added, simple drawing. The most important move was the shift of the two halyard-blocks from each other. The first block remained on its place, f.e. fixed with a line behind a clew on the halyard-boom. The second block was moved some 30-40 cm’s more above on the halyard, fixed on a distance with the same rope or line. Doing so, there were two improvements: – the halyard ropes did not wringle anymore in the top – each of the two blocks on the halyard did it’s job better; one fastened the halyard stiff around the mast, the other hoisted the halyard to its peak. On top in the mast, not aside but on the backside, there is a double-block. The halyard rope does not wringle at all. The pulling part goes totally free to the deck and the other part, around the mast and fixed to the halyard, goes lineair with the pulling part, but does not wringle at all with the pulling part and the part of the ropes to the second “peak-block”. My experience is that this change in 30-40 cm’s between the two blocks on the halyard could be the core-solution of the wringle problem. Furthermore I changed my “classic tufnol blocks” for Lewmars. Radius of the blocks 70 mm because I use comfortably thick 12 mm halyard-rope. Lies very agreeable in your hand. The result was an absolute improvement. Halyard and sail almost fell down between the lazy-jacks on the boom, when unlocking the halyard lock. 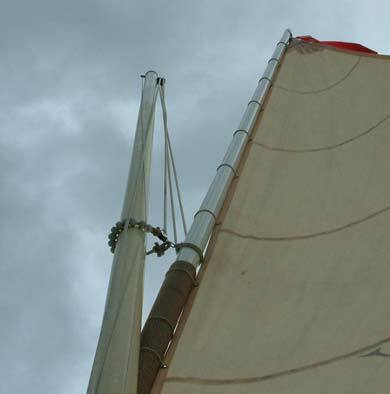 I even had to brake the downfall a little to prevent a falling halyard and mainsail and to lower the sail more smoothly. 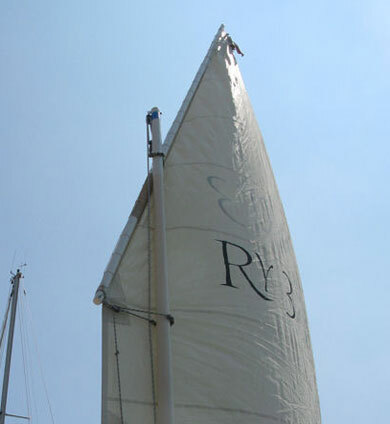 Remaining to point out that I sail my Romilly with a boom and often sail single. And in Holland there are a lot of bridges and locks, where you have to lower your sail quick and smoothly and caught in lazyjacks on the boom very safely. Maybe a tip for other Romilly-captains, who “suffer” from wringled halyard-ropes in their bad dreams! I am certainly going to try the 30 cm trick. Just replacing the tufnol bloks with modern blocks with roller bearings (I choose Harken) already makes a big difference. Rinus’ arrangement looks very interesting and logical. And he does appear to reinforce the view that the masthead block should be shackled to an eye aft of the mast rather than the side.